The adult hobo spider is a moderately large (12-18mm body length) brown spider, with long, unmarked legs (legs included, a typical specimen would fit nicely on a silver dollar). The dorsal abdomen exhibits a “herringbone” or multiple chevron patterns, which may be quite obscure in darker individuals. The male sports two pedipalps (antennae-like protuberances) between the two front legs, which are swollen at the ends, looking somewhat like a pair of boxing gloves; these “boxing gloves” are actually the male genitalia, not “fangs” or “poison sacs”. The female generally has a larger abdomen than the male and does not have swollen “boxing gloves” at the ends of the pedipalps. The hobo spider (Tegenaria agrestis) is a member of the genus of spiders known colloquially as funnel web spiders. It is one of a small number of spiders in North America whose bites are generally considered to be medically significant. Individuals construct a funnel-shaped structure of silk sheeting and lie in wait at the small end of the funnel for prey insects to blunder onto their webs. Hobo spiders sometimes build their webs in or around human habitations. Although this species of spider has a reputation for aggressiveness, they will normally avoid contact with humans. Most bites occur when the spider is accidentally crushed or squeezed by a human. The spider’s venom is strong enough to cause considerable local pain. Chuck Sullivan Exterminators provides an All Pest Service Guarantee so you won’t have to worry about spiders in your home or commercial building after treatment has been applied. 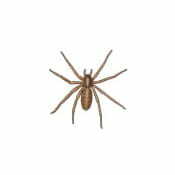 Spiders are INCLUDED in the All Pest Service guarantee.